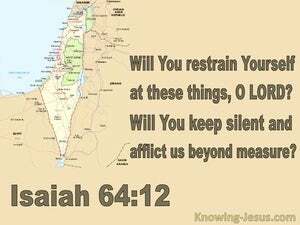 ﻿ Isaiah 64:12 Will You restrain Yourself at these things, O LORD? Will You keep silent and afflict us beyond measure? Lord, after all this, will You restrain Yourself? 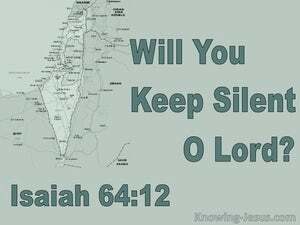 Will You keep silent and afflict severely? Will thou restrain thyself for these things, O LORD? Will thou hold thy peace, and afflict us very severely? For these wilt thou refrain thyself, O Jehovah? wilt thou be silent, and wilt thou humble us even greatly? Will you control yourself because of these, Yahweh? Will you be silent? And will you oppress us exceedingly? Will You restrain Yourself over these things, O Jehovah? Will You be silent and sorely afflict us? Wilt thou not be intreated, LORD, for all this? Wilt thou hold thy peace, and scourge us so sore? In view of these things, wilt thou restrain thyself. O Yahweh? Wilt thou hold thy peace and humble us so very greatly? 11 Our holy and beautiful house, Where our fathers praised You, Has been burned by fire; And all our precious things have become a ruin. 12 Will You restrain Yourself at these things, O LORD? Will You keep silent and afflict us beyond measure? "I have kept silent for a long time, I have kept still and restrained Myself. Now like a woman in labor I will groan, I will both gasp and pant.